Old mid-power CB transistors in TO-220 style are not easy to get. Most of them became obsolete the recent years and that’s why Chinese fakers have discovered this and started to flood the market with more or less well veiled counterfeits. 2SC1307 and 1306, 2SC1969, 2SC2166, 2SC2078, 2SC2312 are the well-known ones that are mainly prone for being counterfeited. I came across a Chinese ebay vendor named “goodtr….” about one year ago who claimed to have original 2SC1307s available for a comparatively low price. “OK,” I thought, “let’s give the guy a try!” I ordered a bunch of 6 transistors and received them some weeks later. The price for 6 pieces was abt. 16$. Unfortunately I didn’t have the time to test them instantly after the postman had dropped them into my letterbox, so they went into my stock for a while and I nearly had forgotten them. Some months later I needed to replace the final amp transistor of one of my rigs and wanted to give one my recently purchased 2SC1307 the debut. After having desoldered the defective old transistor out of the rig I installed one of those Chinese “2SC1307” semiconductors from “goodtr….”. After having powered up the rig and having switched it to transmit, I found that there was no rf power except from some 50 Milliwatts instead of 5 Watts. Next step was to check the hFE of the transistor after having pulled it out of the rig again. hFE was OK (about 130) and I was thinking what could be wrong. A short web research brought me to the “You have been fooled”-topic. Next step: I have an old CB rig here (Uniden PC 40) . I desoldered the rf main amplifier stage and put in the Chinese “2SC1307”. Same result: I really had been deceived. And unfortunately Paypal’s buyer protection was no longer valid because the date of purchase was too long in the past. Sh..! Due to the fact that I don’t need that Uniden CB radio any more, I decided to convert it to an Rf power transistor testing machine. For further buyings of RF power transistors. Into the mounting place of the original final amplifier transistor I put in a 3 lead socket to take a TO-220 transistor. Each time I get a new package of RF power transistors today, the first step is to check them out in the former CB rig if they are able to deliver the desired output power. How can we recognize fake RF transistors? Guess what the fake is? 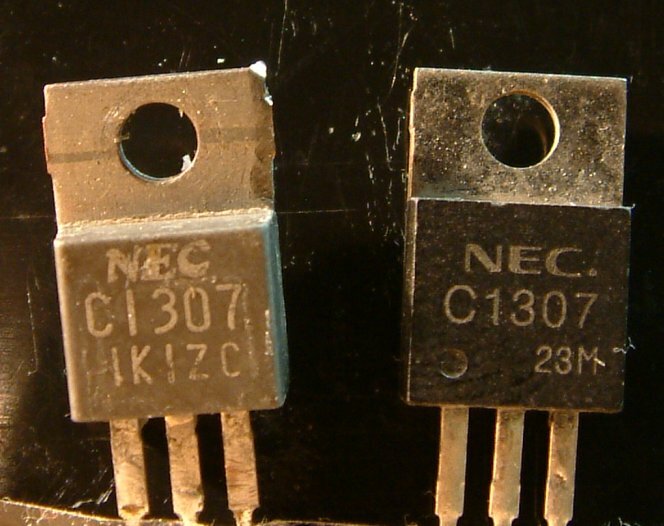 On the left side you can see an original 2SC1307 made by NEC that has been pulled out of an old CB radio. The fake is on the right. Usually it’s an ordinary AF or switching transistor inTO-220 housing re-labelled with the ID of a pretious RF power device. What to keep an eye on: First the “NEC” logo is completely different on the right side (fake) compared with the left (genuine) one. Also the font is different. So is the printing. Fakes are usually labelled using thin grey and weak colors. Sometimes the painting can be wiped off just with your fingers! Second, the shape of the transistor’s body is also different: The upper part where the device is mounted to the heatsink does not look the same. The fake part has straight edges whereas the genuine one has a slightly widened space around the mounting hole looking like a double nose. Recently I purchased some LM338 power regulators from a German ebay seller in Augsburg. When testing them I realized that the regulator after some minutes that it had delivered about 900 milliamps got a short circuit between input an output. I was lucky that the power supply I had built for my QRP rigs was still under test otherwise it might have damaged the rig seriously, because there were 20 Volts on the leads. Fakes like these are also easy to recognize. First watch the “National Semiconductor” logo and compare it to the original. As you can see the bows of the “S” end up in the wrong position. With the original logo they terminate somewhere next to the center of the “N” midth of the logo. But the fakers have put the bows’ ends right to the edge of the “N”. Next get an image of an original LM338 on the web. But avoid those Cinese websites were you can find the next bunch of fakes. Go to a US or European based seller. There you can find how this regulator should look like. Next check the price. 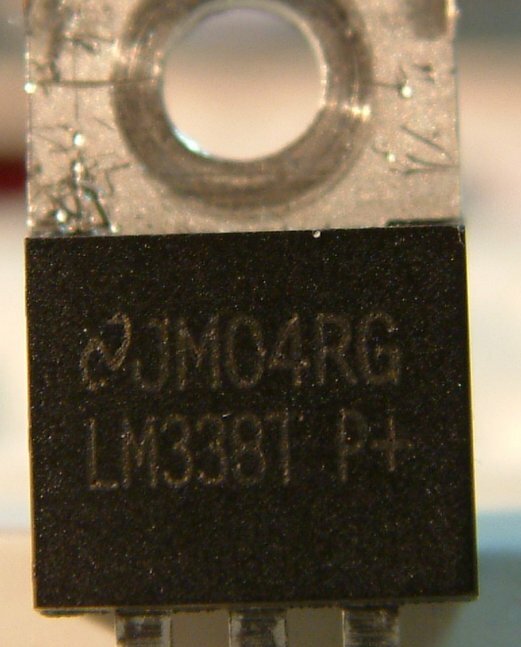 The fakers sell the LM338 in TO-220 shape for under 1$. The serious vendor instead asks you for 2 or 3$. Got an idea why? I usually buy lots of electronics at eBay and, fortunately, never had any problem. Nevertheless, I will take in consideration the possibility of having a fake component the next time I need to debug some circuit with components bought at eBay. Thanks for commenting on the article. Your contribution is very much appreciated. I replaced the old Mitsubishi 2SC1969s in my 10 Watts 5 band QRP rig by ELEFLOW’s transistors because one of the Mitsubishi’s went dumb and lost 90% of its gain. I found out that the ELEFLOW substitudes work perfectly and additionally offer 1.5 Watts more pep output power than the originals. So for short: Breadboard, 1 RFC, 2 capacitors and there you go. I put in two genuine 2SC1306 and had the expected amplification on the pwr-meter to a 50R dummy load. put in the fakes -> about nothing. I had an FT1000 with burn out in PA. I bought one 2SC2166 and two MRF486 on ebay June 2017…Radio gave 200watts on 3 mhz and 150 watts on 7Mhz and zero then up to 30Mhz. Obviously these are low frequency transistors re-badge to sell at better profit. Not easy to spot from ebay photo! easy to tell once installed. Joe Island Electronics NZ. I just got duped buying 5 pcs of LM338T from Ali-express. It works as expected up to 5V @ 1A, beyond, no go. Unloaded shows 10V, as soon as I load it, drops to 7V. Learned my lesson for $1.40 but filed a dispute to get my money back. Get an Atlas semiconductor tester, they work great. Why pay close to $100 for an Atlas, when I can get a nice tester (LCR-T3) for less than $8, which alos measures LCR components ??? me thinks you work for them.